Back when the Declaration of Independence was signed, it was unlikely our Founding Fathers expected the Fourth of July to become synonymous with fireworks, picnics, and indulging in alcoholic beverages. And yet, it's estimated Americans spent more than $1 billion on beer for the Independence Day holiday in 2016, according to WalletHub. Pair that with the 32.9 million Americans planning to travel for the holiday, according to the National Retail Federation, and we're looking at a situation that should give us all a little pause. Driving while intoxicated — even if you think you are just "buzzed" — is never the right decision. Last year, there were 293 alcohol-related crashes resulting in eight fatalities from Friday, July 1, to Sunday, July 10. And, according to the same PennDOT data, there were 101 drug-related crashes resulting in four fatalities in that same holiday period. "PennDOT is working closely with our partners in law enforcement to reduce impaired driving and raise safety awareness this holiday," PennDOT Secretary Leslie S. Richards said. 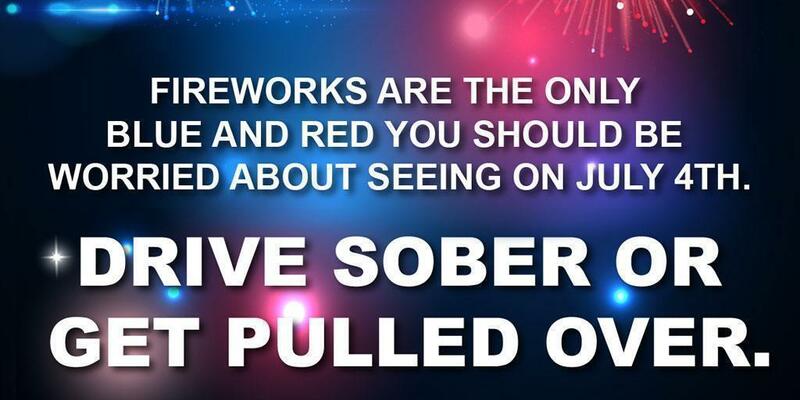 "Though Independence Day is a time for celebration, we urge Pennsylvanians to designate a sober driver and wear their seat belt throughout the coming weekend, and throughout the year." Over this holiday period, the Pennsylvania State Police and local law enforcement will conduct checkpoints and roving patrols. This effort is funded through PennDOT's statewide distribution of more than $4.7 million from the National Highway Traffic Safety Administration. Did you know that under Pennsylvania law, boat operators can be arrested for boating under the influence while operating any watercraft if they are incapable of safe operation? Waterways Conservation Officer Emmett Kyler noted, "The penalties for an individual convicted of BUI are very similar to the DUI penalties with the exception an individual will lose their boat operating privileges as opposed to their driver's license. This is always a huge misconception." The Pennsylvania Fish and Boat Commission's waterways conservation officers will be increasing patrols on the water and at recreational boating checkpoints throughout the Fourth of July weekend and through the holiday. Last year, PFBC arrested 90 individuals for BUI. There were 11 deaths due to boating accidents — alcohol was a contributing factor in six of those cases. "As a part of the community ourselves, we want to ensure that recreational boaters, paddlers, and anyone enjoying our waters have a safe place to spend their time on the water," says Col. Corey Britcher, director of the PFBC Bureau of Law Enforcement. "Alcohol impairs judgment and reaction time on the water just as it does when driving a car, even more so because of the added stressors of sun, heat, wind, and noise on a boat."